Try these Peanut Butter dough bars topped with peanut butter cups. 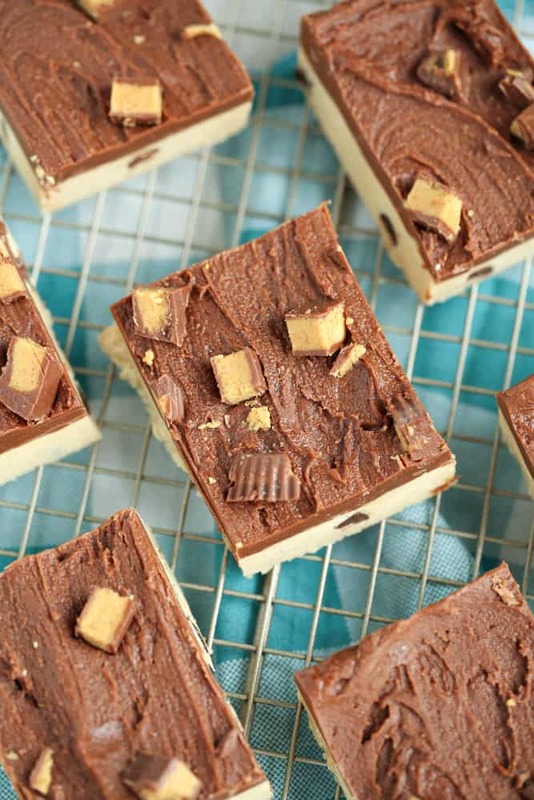 They’ll quickly become your go-to favorite treat recipe! 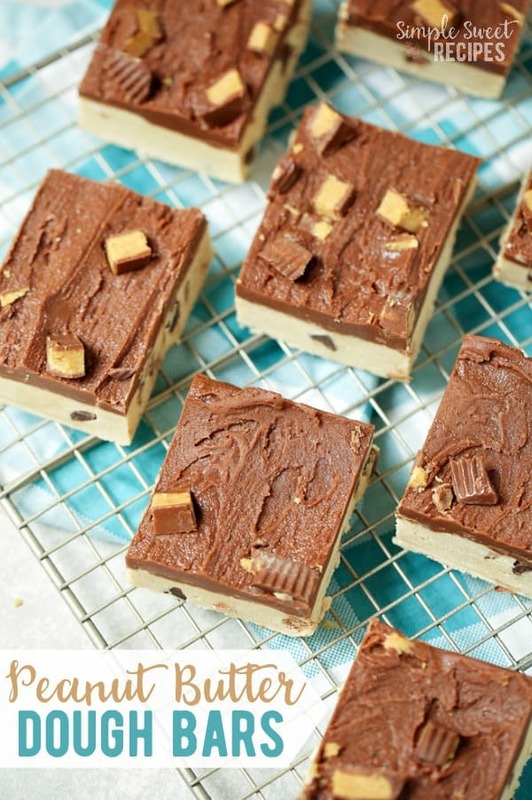 Combining cookie dough and layers of peanut butter and chocolate – there’s not much better. Is there anything better than cookie dough? 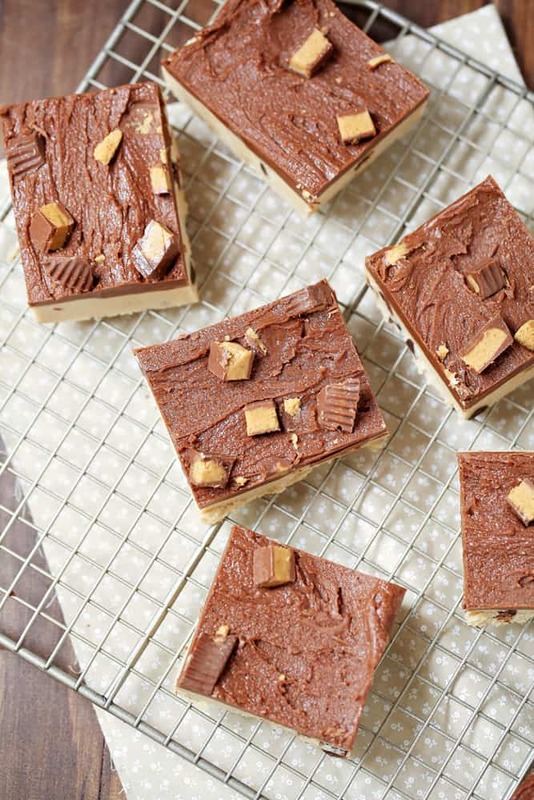 But this recipe tops it with the added creamy layers of chocolate and peanut butter! 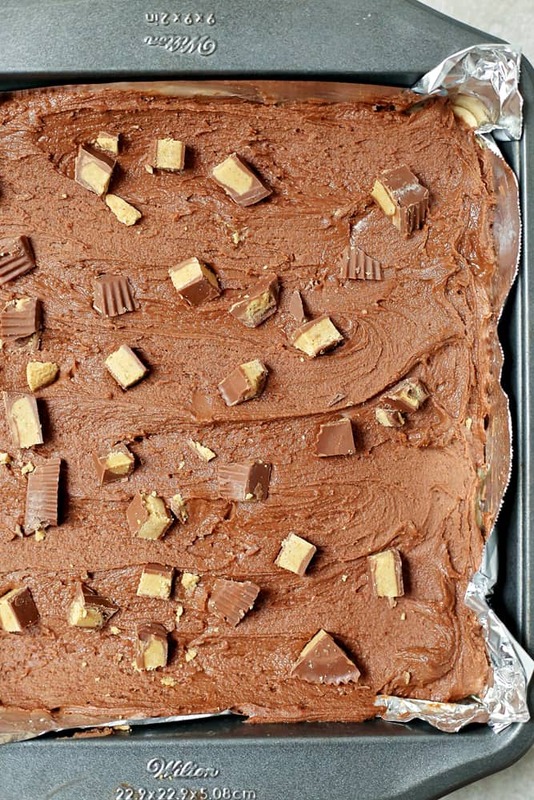 Sprinkled with chopped up Reese’s peanut butter cups on top and this recipe is just everything. All my favorite flavors rolled up into one incredibly easy to make recipe. 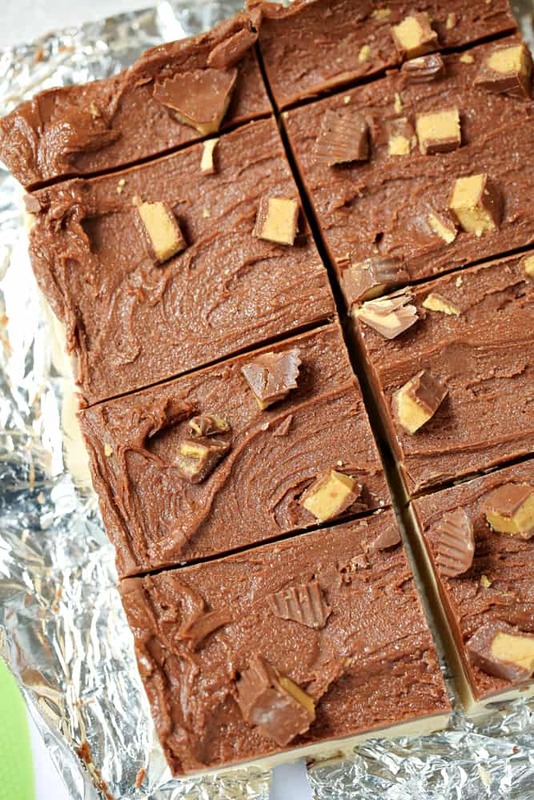 Seriously, you’ll need less than 10 minutes to make these yummies. Then just refrigerate until they’ve firmed up and are ready to be diced and served, they won’t last long. 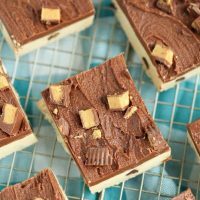 These Peanut Butter dough bars are one of my favorite goodies to bring to gatherings as they look so impressive with the layers, but they take hardly no effort. Beat peanut butter, butter, brown sugar, vanilla, and condensed milk until evenly blended. Add in flour, a little at a time, until fully incorporated. Line a square 8x8 pan with foil, spray, and pour in batter. Press down to form a level sheet of dough. Set aside while you make your icing. Make the icing by melting chocolate chips in the microwave using :30 second intervals, mixing frequently. Add peanut butter and powdered sugar. Mix thoroughly. *If you find your icing is too dry, add more melted chips. 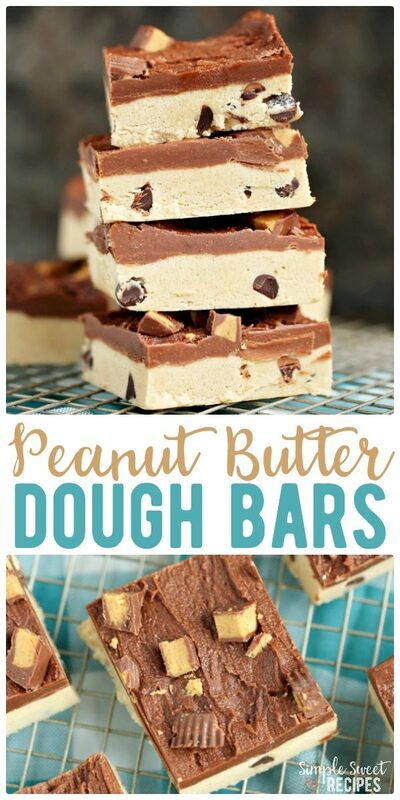 Spread on top of cookie dough, sprinkle on chopped peanut butter cups, and refrigerate for at least an hour. Those look truly sublime! I can’t wait to give them a GIANT bite and share with my whole fam. 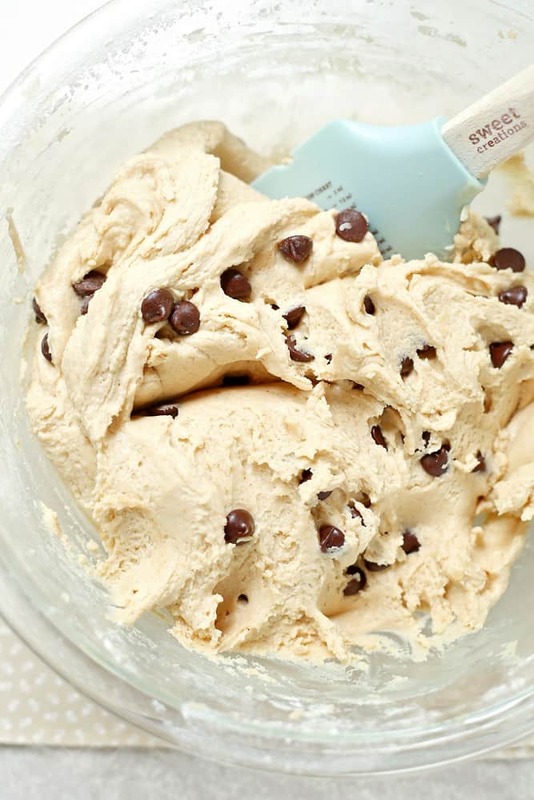 There is nothing on Earth better than cookie dough, unless you top it with even more deliciousness. These bars look too good to be true! Can’t wait to eat an entire pan by myself. Peanut butter and chocolate are my favorite combination. I’m really impressed with how clean your cuts are. They’re perfectly rectangle and without any bites out of them! I totally love the cookie dough better than the finished baked cookie. My kids are following in my footsteps with that so I know this recipe would be a huge hit with all of us. Delish! Ah…. my favorite Peanut Butter anything!! Yum. I am pinning this and will be trying them soon. 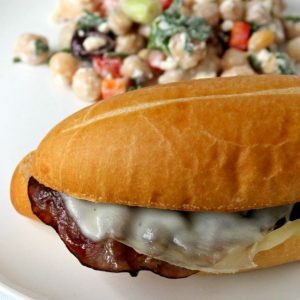 Making this tonight, thank you for sharing!